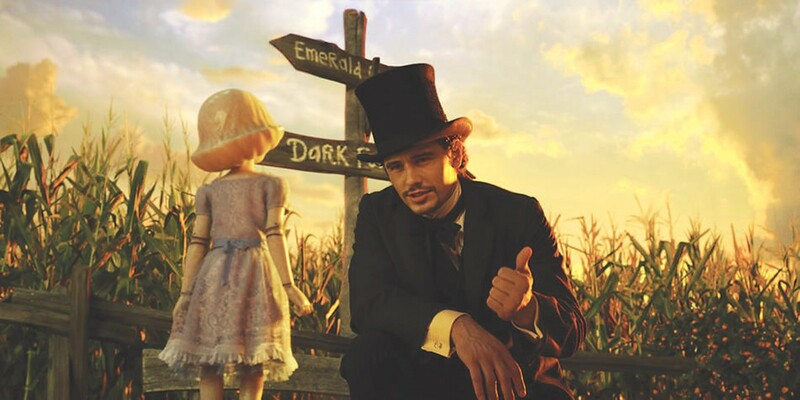 PHOTO COURTESY WALT DISNEY PICTURES James Franco and China Girl in "Oz the Great and Powerful." As the new movie "Oz the Great and Powerful" demonstrates, L. Frank Baum's fantasies about the magical land of Oz remain a source of enchantment for filmmakers and audiences. Dramatic and cinematic adaptations of the stories date back to the early years of the 20th century and continue through the present day, with such works as "The Wiz," "Oz," and the current Broadway hit, "Wicked." None of those versions, of course, attains the excellence of the great 1939 movie, "The Wizard of Oz." That picture, appearing in what may rank as the greatest single year in the greatest single decade of Hollywood film, overwhelms any sequel, remake, or imitation. Possibly to deal with the challenge of its predecessor, the producers of "Oz the Great and Powerful," decided to solve the problem by making a prequel, an invented back story showing the origins of the famous wizard and his own adventures in that dream country over the rainbow. Like the original, the movie begins in black and white in some arid little spot in Kansas, long before Dorothy's dream, where a small-time magician named Oscar, nicknamed Oz (James Franco), works in a shabby carnival, dazzling the locals with sleight of hand and cheap illusions. Something of a low-rent lothario who romances a number of comely young women, he must escape the pursuit of the enraged strong man, whose wife succumbed to his charms. Oz jumps into the carny's hot-air balloon, enters the vortex of a tornado, and of course crashes in Oz itself, a land of pastel colors occupied by an odd assortment of characters. From that moment Oz encounters a series of fantastic adventures, complete with weird creatures and supernatural effects. He rescues a flying monkey named Finley (Zach Braff, who also plays his assistant in the carnival) from a monster, and meets Theodora (Mila Kunis), a witch who believes he is the great wizard foretold as the savior of the land that bears his name. They journey to the Emerald City, where Theodora's sister Evanora (Rachel Weisz), also a witch, harbors her own ambitions for the throne of Oz and plots against him. The magician meets yet a third witch, Glinda (Michelle Williams), who helps him in his attempts to protect the citizens (Oztralians perhaps?) from Evanora's evil plans. Instead of such remarkable characters as the Tin Woodsman, the Scarecrow, and the Cowardly Lion, Oz must depend on the comical Finley and a doll named China Girl (Joey King), and all too briefly, the Munchkins. One of the movie's major problems involves its adherence to the conventions of contemporary blockbusters rather than the sense of wonder in the Baum fantasy and the film it inspired. Instead of attempting something resembling the charm of the original performers, the delightful songs and dances, the director, Sam Raimi, substitutes the special effects (in 3D) of any expensive, overproduced spectacular currently shaking the walls of any megaplex. The Munchkins don't sing, nobody dances on the Yellow Brick Road, no horses change color, and even the Emerald City doesn't really look green enough. In keeping with current fashion, the picture includes a climactic battle much like any of the tiresome titanic struggles of the X-Men or Spider-Man, in which Oz employs his carny magician's tricks to fight against the magic of the evil witches. Although it very nicely foreshadows the wizard's methods in the original film and cleverly employs the technology that he knows from his own time and place, it also serves as the usual vehicle for the same old pyrotechnics and stunts that so many contemporary viewers mistake for filmmaking. James Franco's one-note performance grows as dull as the whole movie, while the other principals match him with offensively excessive overacting. For all its special effects, its explosiveness, and of course the necessary computer-generated imagery, "Oz the Great and Powerful" lacks the wit, the liveliness, and the imagination of the original. The whole enterprise demonstrates the brilliance of those films of what now seems the ancient past of American cinema at is best, and will surely make anyone long for a sadly lost world, and the presence of Judy Garland, Bert Lahr, Ray Bolger, and even Toto.